The mood is in contrast to an earlier meeting between President Trump and French President Macron. PARIS — Traveling from around the world to monuments honoring soldiers who fell 100 years ago, victors and vanquished alike marked those sacrifices Saturday ahead of Armistice Day and assessed alliances that have been redrawn dramatically since World War I. After Chancellor Angela Merkel briefly snuggled her head into the neck of French President Emmanuel Macron, the two went inside a replica of the train car where the armistice was signed and put their names in a guestbook. 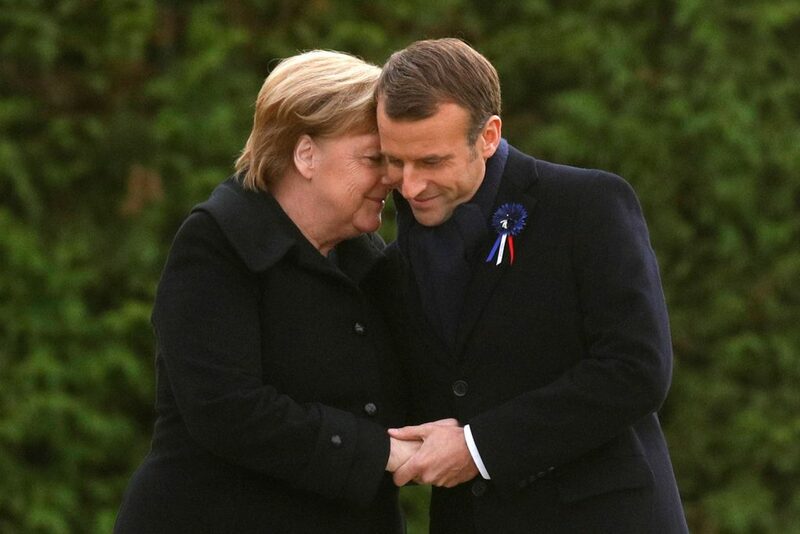 Macron then took Merkel’s hand in his, again highlighting the changes on the continent where two world wars were fought in the 20th century. Canadian Prime Minister Justin Trudeau places a flower at a gravestone as he tours the Canadian Ceremony No. 2 near Vimy Ridge, France. The open show of affection was a welcome antidote for Macron. Earlier Saturday, the French leader had a somewhat awkward meeting with President Trump. As Air Force One landed in Paris on Friday night, Trump wrote on Twitter he had been “very” insulted by comments Macron made in the days before that he considered anti-American. A century ago, the entry of U.S. troops into World War I tipped the momentum toward its allies, including France and Britain. Even as he embarked on two days of observances for the Nov. 11, 1918 armistice, Trump said the United States now bears far too much of the burden to defend the West. In the four years of fighting, remembered for brutal trench warfare and the first use of poison gas, France, the British empire, Russia and the United States had the main armies opposing a German-led coalition that also included the Austro-Hungarian and Ottoman empires. 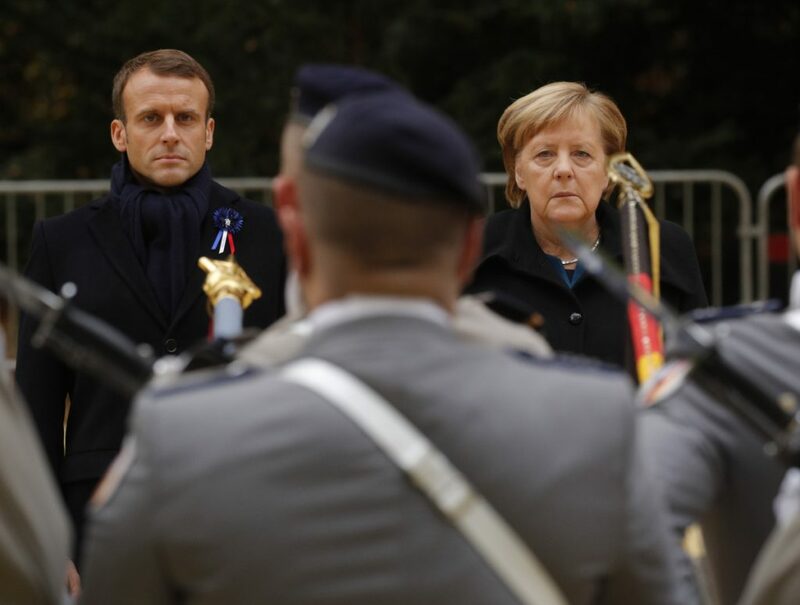 French President Emmanuel Macron and German Chancellor Angela Merkel inspect a joint military brigade of troops from both sides during an Armistice Day ceremony, 100 years after the end of World War I on Saturday. 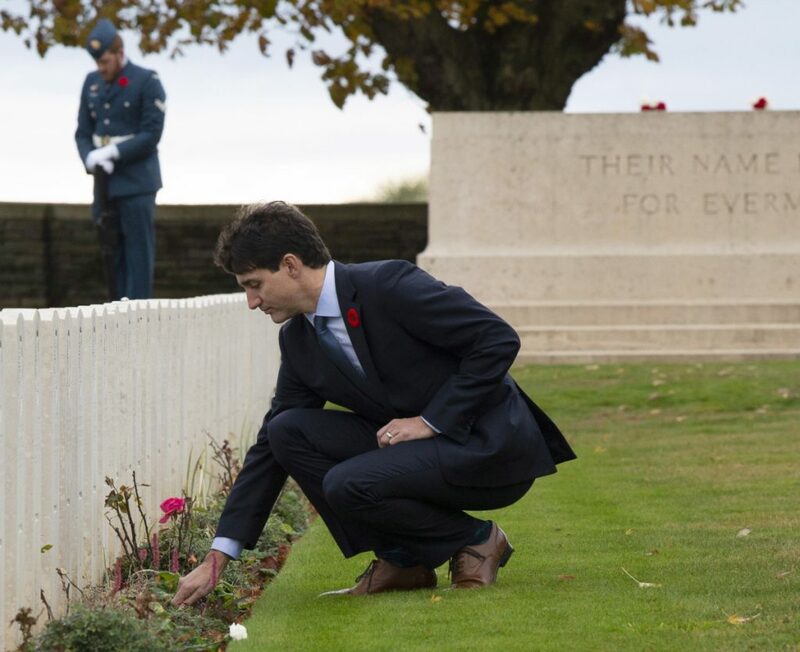 At dawn on Saturday, Canadian Prime Minister Justin Trudeau went to Vimy Ridge, the battlefield in northern France where Canada defeated German opposition against the odds. After his meeting with Macron, Trump had been scheduled to head to the battlefield of Belleau Wood, 55 miles northeast of the capital, where U.S. troops had their breakthrough battle by stopping a German push for Paris shortly after entering the war in 1917.